We are a group of SOAS Anthropology students raising money to keep the Helen Kanitkar Library running. For many years, Dr Helen Kanitkar was a Lektor in the Department of Anthropology at SOAS. Students and staff from that period will recall the warmth and pastoral care she extended to generations of students. No knock on her door ever came at an inconvenient moment. When Dr Kanitkar sadly passed away in 2001, her husband Hemant funded the refurbishment of the departmental library that Helen had loved so much, and donated 800 of her books. It was reopened as the Helen Kanitkar Library and Research Centre (HKL), a unique research library and study space for the Anthropology Department at the School of Oriental and African Studies (SOAS), University of London. 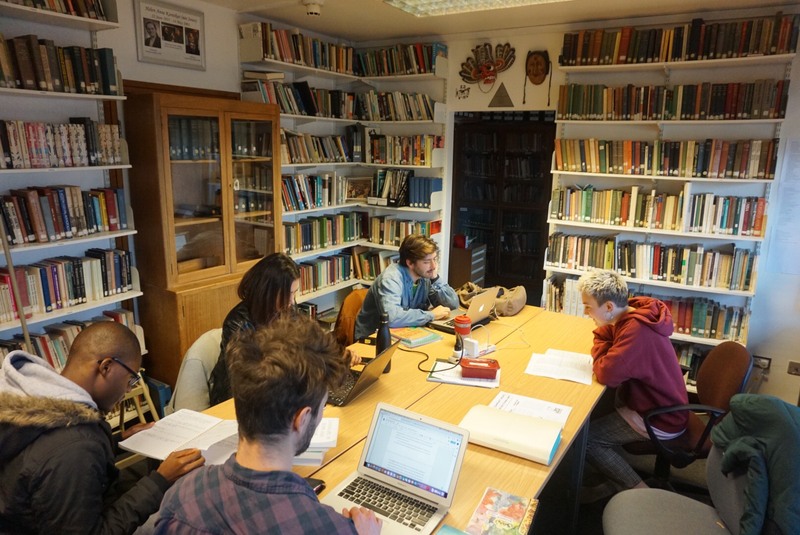 The library has become a vital resource for Anthropology students, providing a space where they can gain support, access past dissertations, and work alongside peers. However, the HKL depends on donations to stay open and we need your help! The library contains popular anthropological texts, journals and course handbooks relevant to current BA and MA Anthropology courses. Also stored in the library are past First Class BA Independent Study Projects and MA dissertations, as well as MPhil upgrade documents and PhD theses. Students often remark how important these archives are for their academic development as they find much inspiration and guidance in past students’ work. The HKL is more than just a library! However, the HKL is not just a room of books and dissertations. It is a place for writing and research, group and individual study, and peer advice and support. This relaxed and personal environment encourages friendship and creativity across the Anthropology Department, establishing connections between BA, MA and research students. The HKL also hosts various events run by and for Anthropology students, including a dissertation lecture where undergraduate and masters students present their independent research projects to the wider student body in order to receive invaluable feedback and inspire others. We are forever grateful for our wonderful group of dedicated student volunteers who keep the library running smoothly five days a week. However, the HKL still requires some financial support. If you are able to contribute, your donations will enable the Anthropology Department to continue to appoint a Head Student Librarian to coordinate volunteers, catalogue books and dissertations, and fulfil Helen Kanitkar's ambitions of bringing students together in a place where diversity and difference are celebrated. The position has provided valuable work experience for SOAS students and we hope to be able to continue to offer this opportunity. Please help us continue the Kanitkar legacy and the living reminder of a much-loved colleague. Thank you for your kind donation! We really appreciate your help keeping this vital study space open. Thank you for your generous donation! Feel free to come visit the library you are helping to keep open. Please contact the student librarian Seren Thomas 637734@soas.ac.uk to arrange a convenient time. WOW. Thank you so much for your generosity! We welcome you to drop by the library to help yourself to a free cup of tea and see the good cause that your money is contributing to. Please contact the student librarian Seren Thomas 637734@soas.ac.uk to arrange a convenient time.